Hunter's Beach, a 360° spherical panoramic timelapse with exposure ramping from sunset to Milky Way to sunrise! Aaron D. Priest is a Master Photographer with twenty years of experience in professional photography. 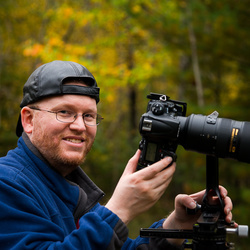 He specializes in high-resolution HDR 360° panoramas, gigapans, and 4K timelapses of Maine. He also creates virtual tours and teaches photography workshops on a variety of topics, from landscape astrophotography to panoramas and timelapses. His work has been featured by CBS News, Space.com, Accuweather, PetaPixel, Roundme, TeliportMe, Google, and in several galleries, magazines, and newspapers. Aaron is a pioneer in the developing field of high-resolution, high-dynamic range imagery, in particular spherical and gigapixel panoramas, virtual tours, and 4K / 360° timelapse video. With his background in photography and computers he has been able to help develop and test software and hardware for many companies in this growing market. Contact me for custom rates on photography projects and workshops. I'd love to hear from you!